Row By Row Experience > 2017 Row by Row Kit "How We Roll"
2017 Row by Row KIT. Unfinished dimensions: 9.5" x 36.5" Alternate size included in pattern for wall hanging or table topper, finished size: 12" x 42"
Kit includes Full Size Banner Roll PATTERN, all Fabric to complete your row top. 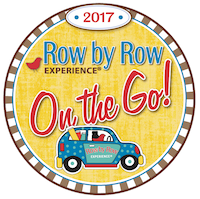 Specially created for the 2017 Row by Row On the Go Experience. Roller Skates were was designed by shop owner Dawn Farrier. Many of her childhood memories include hours of roller skating along the sidewalks near her home.